Chokeberry juice, how to make and dose it? In the last couple of years chokeberry has become highly sought after and appreciated in Phytotherapy. Although until recently it was little known about, today the Siberian chokeberry is available all around the world. Its cultivation is very easy, and because of its excellent healing power it has become very popular. It also has no natural enemies, so it is not necessary to spray it, and therefore falls within the 100 percent organic plant. It is known that it raises the entire immune system, is an excellent antioxidant and even has anticancer and antiviral effect. Chokeberry is both food and medicine. Below read why chokeberry juice us good, how to make and drink it, and what the experiences of others with this plant are. What are the healing properties of chokeberry? The plant is a berry fruit, their appearance is reminiscent of blueberry, and is therefore also called Siberian blueberry. It comes from North America, where it was transferred to Europe. It is resistant to low temperatures. It withstands cold winter and strong frosts. It grows as a shrub, can reach a height of about two meters. Medicinal and edible plant part is a fruit that is sometimes bitter taste. Chokeberry remains on the bush up to two months after maturation. The plant ripens in August and September. These medicinal berries are a wonder of nature, the plant is completely organic, and so you can be confident that it is not harmful because of pesticides that are very much used in the industry today. It is not difficult to cultivate it, and in many parts of the world, this fruit is rightly classified as medicinal plants, because of their exceptional healing properties. It is worth noting that the natural chokeberry juice is almost three times healthier than blueberry juice. When making a syrup from chokeberry it still contains fresh berries and does not lose its healing properties. Chokeberry is rich in vitamins A, B, B1, B2, B3, B6 and B9, C, P and vitamin E. In addition to stated ones the valuable chokeberry juice contains minerals such as calcium, potassium, manganese, iron, iodine, phosphorus and zinc. With all of the minerals and vitamins chokeberry has one of the strongest antioxidants-anthocyanin. Once this phenomenal antioxidant gets into our bodies it has a strong effect on the detoxification and discharges of harmful substances that are found in our bodies. According TEAC and ORAC standards chokeberry juice has the highest antioxidant activity of all the berry fruits and nuts. Why is chokeberry juice good for health? The healing properties of natural juice of chokeberry are difficult to list all at once. Many of the research revealed that this plant dark berry improves blood circulation, and that daily use reduces the levels of e-cholesterol and triglycerides, thus protecting our cardiovascular system. It is excellent in purifying the blood, relieves migraine and headache, has a beneficial effect on the stomach and intestines, stopping diarrhoea, lowers blood pressure, prevents bacterial and viral infections, and improves our immune system. Chokeberry juice has a beneficial effect on the liver and gallbladder, as it purifies and enables the proper functioning of these organs. It is important to note that it regulates the excretion, as well as the proper functioning of thyroid hormones, and regulation of pancreas. It is known that nowadays there are many people who are suffering from cancer, so it is very important to take precautions with chokeberry juice. You can eat healthy, do physical activity, but also you can take this homemade juice, which is scientifically proven to help in the prevention of the most serious diseases. Due to the high content of antioxidant units, it prevents cancer and helps in the treatment of malignant diseases it destroys cancer cells. It also helps in the treatment of Alzheimer's disease. 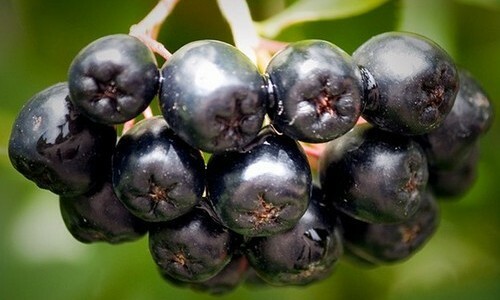 Oddly, but also true, chokeberry also offers protection against diseases of the eyes, that is muscular degeneracy of eyes. This is an incurable disease that leads to blindness. And studies have shown that people who consume the juice of chokeberry are less likely to get this disease. Aronia encourages the healing of wounds, slows down aging of the skin and the body, it also prevents the formation of wrinkles and protects against negative UV rays. And to sum up the impressions, this is an excellent investment for our health. Healing aronia juice can be bought independently. It is more expensive than most other juices but if you drink it in small quantities, the price should not be such a big insurmountable problem. Chokeberry is often used in dried form which can also be eaten, but it is still most commonly processed into juice. If you are making the juice the recipe is very simple. When aronia fruit ripens, it is best to pack this fruit in the packing of 1 kg and freeze it. If necessary, defrost and make juice. From 1 kg of chokeberry usually you get about 0.7 litres of juice, and sometimes less. Freezing will not have a negative impact on the quality of juice because it is known that chokeberry very well tolerates low temperatures, so that after defrosting it will become even juicier, with more juice than when fresh. It is best to strain the defrosted chokeberry or use meat grinder, to get a real home juice, or as it is sometimes referred to as cold pressed juice. You should not add preservatives to the obtained chokeberry juice. Also it is recommended to drink it without sugar or other sweeteners. It can be kept 24 hours in the refrigerator, but it is recommended to drink it during the same day. Pour the sugar into the water in a bowl and put it on the stove until it boils. When the water boils, add 2 kg of fresh chokeberries. Constantly stir it until the mixture starts to cook. While mixing the syrup, press the berries so they would release as much as juice as possible. When it reaches the boiling point, it is necessary to wait couple of minutes and then remove and allow it to cool. Strain the content and return to the stove to boil once more. After it boils, remove the top and add one squeezed lemon. Stir everything and pour the resulting juice in glass bottles which you previously sterilized and close the bottles. Store the beverage in the dark and cool place and consume if needed. If you really want to you can also dilute it with a little water. The rest of the berries you can use to make delicious chokeberry jam. Fill your refrigerator with domestic chokeberry juice or freezer for longer use and every day enjoy the full taste of the dark berries that give you health in just a few sips. The recommended dose of fresh berries is 300 grams during the day. How to drink the chokeberry juice? Take the amount of 1 to 3 brandy cups daily. For healthy people, the recommended dose is just one glass in the morning on an empty stomach before eating. People who are prone to various colds, should consume one glass before each meal. It is necessary to drink it half an hour before the main meal to take advantage of the more useful components of this phenomenal homemade syrup. The North American Indians used chokeberries for food, so they milled them or dried the fruit, and combined them with a variety of meat from wild animals or with flour. Fresh fruits were used as a cure for stomach problems, medicinal tea from the leaves were used to heal all wounds. To consume it throughout the year freeze, dry or make a jam, syrup, juice, liqueur, brandy, wine or compote. On the market there are many other products of this plant beside popular juice and syrup, among them is certainly chokeberry tea. Russian biologists in the late 19th century explored chokeberry and proved its beneficial properties, while modern scholars began to take an interest in it only during 90s of last century, when it was discovered that chokeberry juice promotes the excretion of heavy metals from the body. It is interesting to mention that the syrup is intensively used after a nuclear disaster in the Chernobyl, especially to reduce symptoms in people who were exposed to harmful radiation. Siberian chokeberry juice is safe and secure to be used in the first year of life, even pregnant women can consume it to combat nausea and heartburn. This plant does not contain gluten, so it can be used with all gluten-free diets. Children can also consume this fruit, especially during flu epidemics and various viruses during the autumn and winter period of the year. Doctors advise to take a break in the spring-summer months when there are more choices of vegetables and fruits. Many Internet forums and social networks testify to the positive experiences of users of chokeberry juice, but always take everything with a grain of salt, today everything is for sale - and even this. Many juice consumers swear that with drinking just one small glass a day before breakfast, raises immunity to a much higher level. Some claim that they had a cold for years and that their circulation improved, bringing their weight to an ideal levels, and that they are full of energy and enthusiasm. Recommendation is definitely right and you should try home-made chokeberry juice, because it is the least you can do for your health and for the health of your children. According to the experiences, chokeberry syrup will significantly improve your health, with constant consumption, and in severe diseases you should drink it at least six to eight months. Where to buy chokeberry juice and what is the price? Natural chokeberry juice you can buy in most of the better-stocked pharmacies, the price per bottle of 750 ml is about 7 dollar. It would be best to buy it from manufacturers who have an official certificate and the same rules apply with online ordering, firstly inform about the manufacturer, and only then insert the product into your virtual basket. Just over a year ago, there was a scandal related to fresh chokeberries that have appeared in the green market, and their price was 3 times lower than the official price. So you always need to be careful, when something is so cheap, quality is always questionable. At the end let us once again remind ourselves that this herb is commonly used in dried form or as juice, but if in your garden you have an empty place, it does not hurt to plant it. Despite its healing power Siberian blueberries look beautiful in the spring when they flower, and in July when they are decorated with fruits, patiently waiting for harvesting in September.